Blood oranges are close cousins to the more common supermarket varieties of orange. Their main difference lies in their pigmented pulp, which can vary from deep orange speckled with red to a solid reddish-purple hue. The pigment is provided by a compound called anthocyanin. Blood oranges are less acidic than regular oranges and their flavor and aroma are faintly reminiscent of raspberries. Nutritionally, they are almost identical to other oranges. Anthocyanin, the red pigment that provides the blood orange's distinctive coloration, is an antioxidant. Antioxidants may provide the body with additional protection against cancer and heart disease. Anthocyanin in particular seems to help lower LDL or "bad" cholesterol levels and keep blood vessels flexible and strong. Like all citrus fruits, blood oranges are high in vitamin C. One medium blood orange will provide you with over 100 percent of your daily vitamin C needs. Vitamin C is another important antioxidant that is a key nutrient for helping to heal and repair damaged tissues throughout the body. Blood oranges are also a good source of folate, also known as vitamin B9. Folate is essential to the early development of a fetus, so women who wish to become pregnant are strongly encouraged to keep track of their folate levels. One blood orange contains about 40 micrograms of folate or 10 percent of your recommended daily intake. Whole blood oranges are a good source of fiber, with 3 grams of fiber per medium orange. That's 12 percent of your daily recommended intake. Fiber helps prevent constipation and maintain the health of your gastrointestinal system in general; it is key in preventing colon cancer. 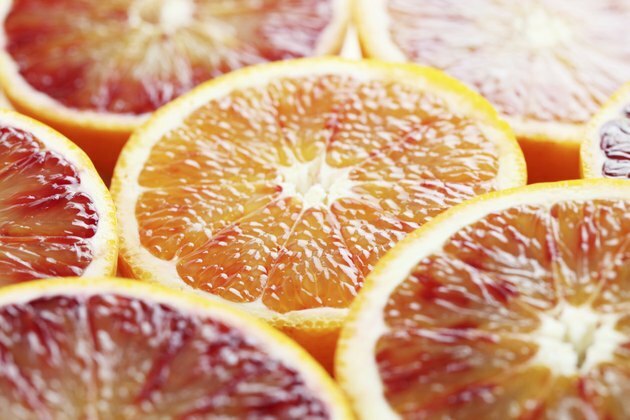 One medium blood orange contains about 80 total calories. What Are the Three Kinds of Blood Cells?